Sebastiane Hegarty is an artist, writer and lecturer. His creative practice is interdisciplinary and time-based, including: sound, installation, photography, performance, drawing and text. His work is concerned with memory through an exploration of the relationship between time, place, and sensation. Most recently this has focused on the materiality of sound and the perceptual geographies of listening, through soundscape composition, field-recording and the production of phonographic objects and actions. Sebastiane has exhibited, performed and broadcast across the UK, Europe and America. Recent works include: Radiophrenia 2017, Glasgow, 2017; Audio Borealis, Bergen, 2017, Helicotrema at Museum Punta della Dogana, Venice, 2016 and It's Eating You, IMT Gallery, London, 2015. Works for BBC radio include, It’s Just Where I Put My Words (Between the Ears, BBC, 2013) and The Sound Artist (Twenty Minutes, BBC, 2011). 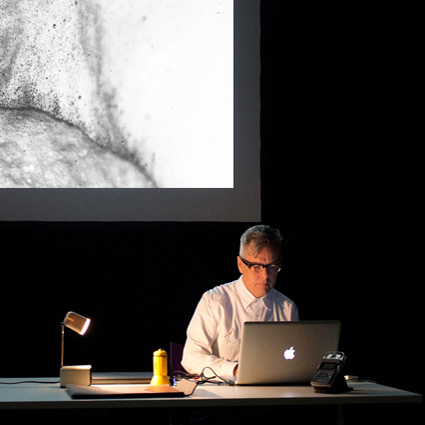 In 2015 he curated the international, multidisciplinary conference, Chalk: time, sense and landscape. Contributors included Prof. John Leveck Drever (Goldsmiths), Prof Paul Whitty (Oxford Brookes), Sally Ann McIntyre (Melbourne Polytechnic) and Guy Sherwin. More recently he has presented papers at Transient Topographies Conference (National University of Ireland in Galway, 2018), LOMA Conference (CRiSAP, London, 2018) and The Sound of Memory symposium (Goldsmiths, 2017). His essay, Lets hear what we can see, which explores synaesthesia and sensory metaphor, accompanies the DVD release of Guy Sherwin’s Optical Sound Films (Lux: London, 2008).